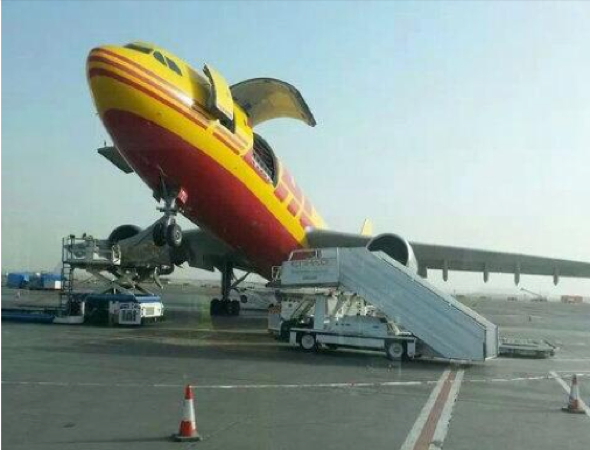 Abu Dhabi: DHL is investigating how one of its aircraft ended up on its tail at Abu Dhabi International Airport on Wednesday. “We can confirm that an Airbus A300-600F aircraft, operating flight DHX520 from Lahore to Abu Dhabi by a DHL airline suffered a nose up incident during the offloading process at Abu Dhabi International Airport on April 1, 2014,” it stated. The German logistics company said it is investigating the incident along with the “appointed handling agent.” It did not say who the agent is. “DHL is liaising with the airport and relevant authorities in order to lift the aircraft to its proper position and to assess the damage,” DHL stated. It further stated that there has been "some damage to ground handling equipment."